Apple's (AAPL) iPad may have sold two million units in just two months, and Amazon (AMZN) may have seen such great success with the market-dominating Kindle that it decided to launch another version this summer, but that hasn't discouraged other players from trying to get a toehold in the e-reader market. Both Barnes & Noble (BKS) and Sony (SNE), for example, have their own e-reader offerings. And now troubled book retailer Borders (BGP) is joining the fray by offering the Libre eBook Reader Pro. What might set the Libre apart from the competition is its price tag, which is the lowest price for an e-reader to date. Though the five-inch device has been on the market (and for sale at Amazon, among other online retailers) since the end of 2009 for $179.99, it will be available in Borders stores July 2 for $119.99 -- half as much as what the Kindle or Barnes & Noble's Nook, at $259 each, costs. The Libre is also $30 cheaper than the Kobo e-reader, which goes on sale at Borders in just a couple of weeks. The Libre's cheap price means fewer bells and whistles. Manufactured by Aluratek, it leaves out a lot the most important features of the Kindle, Nook and Kobo: wireless capability, a large e-library and e-Ink screens. Instead, the Libre has an LCD display, and you must purchase a separate card that will hold several thousand books, as the device itself only has room for 100. Reviews of the Libre have been mostly positive, but no matter how much Borders touts the idea of "giving its customers a depth and breadth of eReader device offerings," it seems a strange strategy when hitching its wagon to the Sony Reader has not paid off and when the much-hyped Kobo is still two weeks away from its own launch date. 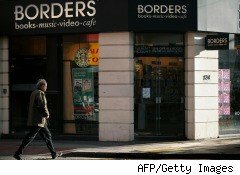 If Borders had priced the Libre below $100, then it might stand a chance in a very crowded e-reader marketplace. But when the prices of much more souped-up devices are set to fall (or, in Kobo's case, start out at a relative bargain) the Libre seems more like a lame-duck.